Look Mum! I’m in the news! Well, the plan was to carry on to Split yesterday. 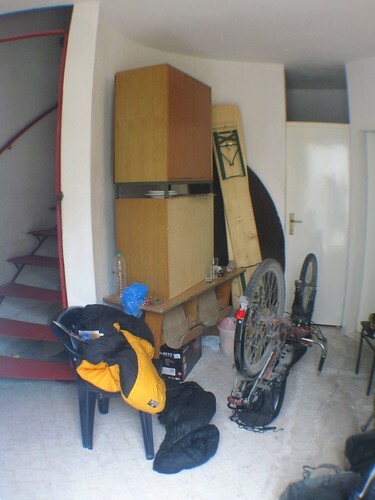 However, there were other forces at play, it seems, and I ended up spending the night last night in the Makarska Bicycle Club club rooms. 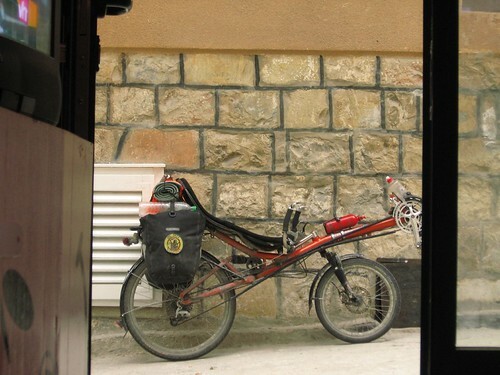 As I was about to leave Makarska, I stopped at a kiosk to buy bananas. A gentleman riding his bike stopped, and asked where I was from and where I was going, and was generally interested in my bike. 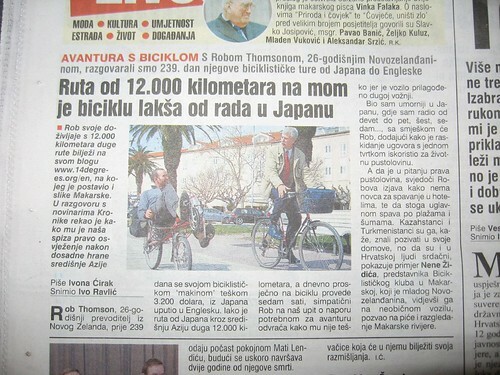 This gentleman was Nenad Zidic, the president of the Makarska Bicycle Club (http://bk.makarska.8m.com/). He invited me for a coffee, and being in no particular rush, I accepted. He speaks good English, and we chatted for a while, before he pulled out his mobile phone and called the local newspaper, the Makarska Kronika (www.kronika.hr). The reporter and photographer arrived in 5 minutes, and proceeded to take photos and notes on my trip. The resulting article came out today in the once a week publication of the Makarska Kronika. Good fun. So today the plan was to catch a ferry across to Brac Island, cycle the 60kms to the other side of the island, then catch another ferry to Split. But the weather looked iffy, and who can refuse an offer of staying in dry, warm clubrooms for as long as I want. So I decided to stay the day in Makarska, and leave tomorrow if the weather has started behaving itself again. I spent some time an internet cafe that actually had reasonable prices. Only 1.20 Euro an hour. 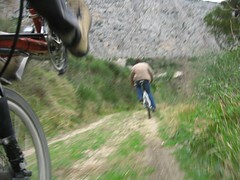 In the afternoon I met up with Roko, a younger member of the bicycle club, for a blat up the mountain behind Makarska. 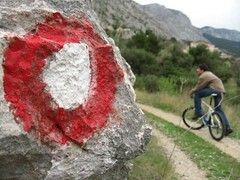 The area is called the Biokovo Nature Park, and a sealed road goes all the way up to the top of Mount Biokovo (1750m). We didn’t have time to go all the way, but had some fun along some back roads on the way. So yeah, Makarska is all good. Great place with great friendly people. And a town square that looks like the one out of the movie Chocolat. Do you actually want to come back to NZ, Rob? Life will be very humdrum here after all the notice that's been taken of you lately. The Croatian language seem to be a bit like French. I can't understand everything in the Kronika article but can get a pretty good idea what it's about. In the news again! You'll have to make sure you're always spik and span from now on. You never know when you will hit the news again. The summer camp counselling sounds like a good way to find out if you like working with kids other than Japanese. I agree. It must be time to add to your daily expenses the price of a shower-in-a-can. It will mean playing table tennis – but you don't have to ping or pong either.